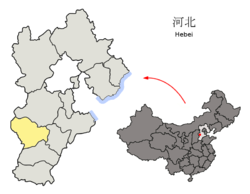 Shijiazhuang (石家庄) is the capital of the Hebei province in China. The city is at the edge of the North China Plain. It is about 263 kilometres (163 mi) southwest of Beijing. This page was last changed on 5 January 2017, at 01:24.